Miss Ellie was never much to look at. Even before she got older, the Chinese Crested Hairless was kind of unpleasant thanks to her pimples, blindness, and the general ugliness of her breed. However, she was a media superstar, appearing in every media from advertising billboards to the Animal Planet show Dogs 101 and even in person at the Comedy Barn in Pigeon Forge, Tennessee, where Miss Ellie was something of a local figure of note. 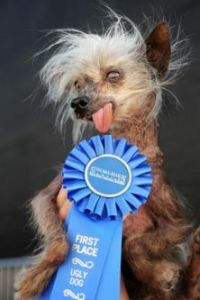 Miss Ellie, the world’s ugliest dog, passed away at age 17. Despite, or because of, her unpleasant appearance, Miss Ellie and her owners were tireless crusaders for good, raising over $100,000 for the Humane Society in Sevier County. She will be cremated. Miss Ellie is survived by her cousins, Bertie the ugliest cat in Britain and Oscar the world’s ugliest bird, and best friend Frankenfish. Poor Miss Ellie was so ugly she was almost cute, wasn’t she? At least she had a nice long life, and very caring owners. We should all be so lucky.